Download our new video now for best practice guidance on procuring design-build and CMAR projects. 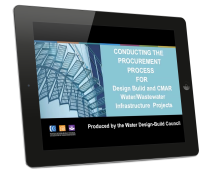 Design-Build and construction management-at-risk (CMAR) project delivery methods have been proven to reduce the cost and time required for water and wastewater infrastructure projects, but many municipalities lack the information and tools necessary to design and implement a successful design-build or CMAR project. To address the needs of municipal owners and industry practitioners, the Water Design-Build Council has created a series of three educational videos. This video is the second in that series. To view the video now, simply complete the form at right.